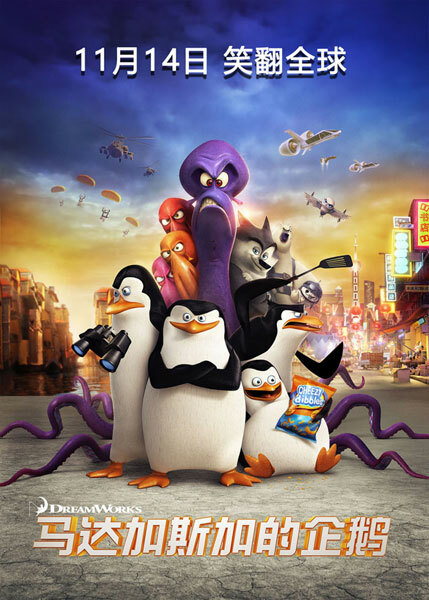 DreamWorks' 3D animated movie "Penguins of Madagascar" hits Chinese theatres on Friday, November 14, 2014. With the voices of Benedict Cumberbatch, John Malkovich and Ken Jeong, "The Penguins of Madagascar" are back in their very own feature film. Featuring the enterprising Penguins from DreamWorks Animation's Madagascar franchise, this comedy adventure stars Skipper, Kowalski, Rico and Private in their very own spy thriller. The penguins join forces with a super-secret animal organization called North Wind to fight a tentacled menace named Dave, an octopus who has made it his mission to kill off all the penguins. "The Penguins of Madagascar" is out in the USA on the 26th November.